President confirms intention to join during trip to the United States. Indonesia intends to join the U.S.-led Trans-Pacific Partnership (TPP), the country’s president Joko “Jokowi” Widodo told an audience while on his inaugural visit to Washington, D.C. on Monday. “Indonesia intends to join the Trans-Pacific Partnership,” Jokowi said to rousing applause, repeating his remarks twice at a roundtable and dinner reception October 26 organized by the U.S. Chamber of Commerce in partnership with the U.S.-ASEAN Business Council and the U.S.-Indonesia Society. Jokowi said that he had discussed many serious issues with U.S. President Barack Obama when the two leaders held a summit earlier today at the White House, making specific reference to the South China Sea. But he used the opportunity to reinforce the message he had delivered earlier today that Indonesia wanted to make its intentions clear about joining the TPP. “So it has been a pretty good day so far,” he added. Jokowi’s statement comes after the recent conclusion of the TPP negotiations earlier this month in Atlanta, whose twelve current members represent more than half of global output and more than 40 percent of world trade (See: “Confirmed: Final TPP Deal Reaching in Atlanta”). Despite Indonesia’s intention to join the TPP, the country will have to undertake significant reforms to get there. Jokowi implicitly acknowledged this, declaring that as first steps, Indonesia intended to free up its private sector from what he termed poorly-conceived policies, excessive permitting and licensing, and unnecessary protectionism, which had caused Indonesian companies to suffer for too long. “Ladies and gentlemen, it is time to free up our private sector,” he declared. 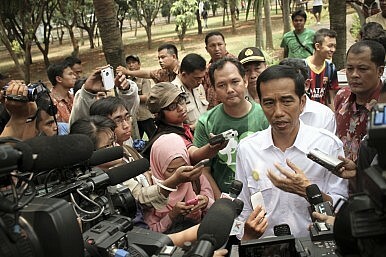 Recalling his own background as a businessman for over two decades, Jokowi said that he himself did not like filling out forms, dealing with complicated regulations and being bullied by vested interests. But he urged the international community to be patient as Indonesia undergoes what he termed “very serious” deregulation under his administration, which came to power last year (See: “What Does Indonesia’s Cabinet Reshuffle Mean?”). “Making things complicated is easy. Making things simple and efficient is hard,” he said, recalling the “genius” of Steve Jobs and Apple who had succeeded in doing so in spite of the challenges therein. Just a few hours before Jokowi’s address, Indonesian officials confirmed that he would cancel the West Coast leg of his trip the United States to return back to Indonesia and coordinate the humanitarian response to the haze caused by forest fires in Sumatra and Borneo. He was initially slated to visit San Francisco on October 28 for meetings and events with technology and business leaders including Microsoft CEO Satya Nadella, Google CEO Sundar Pichai, Apple CEO Tim Cook, and Facebook COO Sheryl Sandberg. “Therefore, if things seem to go slow, please bear with us. Economic reform takes time. Economic reform is a process. We may not get it completely correct right away. But we shall continue performing and improving until we get it right,” he said. The TPP currently groups the United States, Australia, Brunei, Canada, Chile, Japan, Malaysia, Mexico, New Zealand, Peru, Singapore, and Vietnam. As I have reported previously, within Southeast Asia, in addition to Indonesia, which is the region’s largest economy, the Philippines, and, to a lesser extent, Thailand, have declared their intention to sign on to the agreement (See: “Confirmed: Philippines Wants to Join TPP”; and “Does Thailand Really Want to Join the TPP?”).